BRUSSELS, Sept 2 (Reuters) - Usain Bolt is already a triple Olympic and world champion but he will not rest until he believes he has achieved the status of an athletics legend, the Jamaican said on Wednesday. "I'm getting to be a legend. I don't consider myself a legend yet," the 23-year-old sprinter told reporters as he prepared to race in the 200 metres at the Golden League meeting in Brussels on Friday. "I think after the next Olympics and other world championships, if I do extremely well in those I'll consider myself a legend. I want to be a legend, I want to make sure I get my M3 (BMW car) and all those other fast cars." Last month Bolt smashed his own 100 world record when he clocked a remarkable 9.58 seconds at the world championships in Berlin. 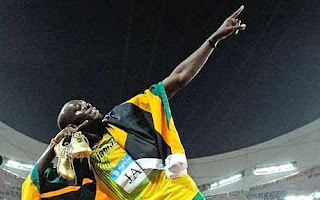 The 6-foot-5 (1.95-metre) Bolt briefly tested the new surface in Brussels and said he was hoping to set a new track record. "My body got a bit tired and I didn't get much time to rest but I am feeling much better than in Zurich (last week)," he said. Bolt won the 100 in 9.81 seconds in the Swiss city on Friday but complained of tiredness after running the final leg of Jamaica's winning 4x100 relay.